Trying to find the perfect romantic getaway, packed with heart-throbbing dates sure to sweep your significant other off of their feet? Love is in the air of Seattle, hanging on the gray clouds enveloping the Olympic and Cascade mountain ranges, and trickling down below into the city. Fuel the fire of romance with these great Seattle attractions that are sure to heighten the attraction between you and your date. 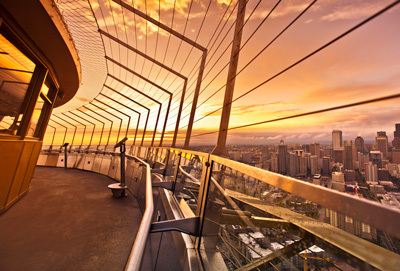 Take your relationship to new heights at the famous Seattle Space Needle. It's the perfect place to see the entire city, 520 feet high in the sky. A 360-degree view of picturesque Seattle is sure to impress any date, and it's a good place to start when planning your romantic itinerary; you can see everything from up there! Get a glimpse into Seattle's history and most famous sights with advanced interactive technology. The Space Needle is one of many romantic dates in Seattle, especially for the sightseeing, outdoorsy kind of couple. Get a closer look with a cutting edge Swarovski telescope, and enjoy the fresh perspective. With Seattle CityPASS, you can take your date to the Space Needle twice within 24 hours. Begin your day with crisp Seattle air by heading to the Space Needle early in the morning, and end it with a breathtaking sunset like you've never seen before. Enjoy a locally flavored lunch at SkyCity restaurant and get a unique, panoramic view of the surrounding mountains, misty bays, and the Emerald City as you dine in the sky. Nothing says romance like a candlelit dinner for two. While Seattle is known for its breathtaking skylight views, Il Bistro's underground setting allows the focus to be on your date, sans distractions. This dimly-lit taste of Italy is consistently voted among the most romantic dining locales in the Emerald City. Tucked away beneath the Pike Place Market, Il Bistro serves sumptuous Italian food. Their wine selection is ample, and they serves Happy Hour Crostinis – a palate-pleasing appetizer. Pasta and seafood, such as fresh mussels and calamari, are another Il Bistro staple. Choose from their selection of authentic Italian desserts to cap off your meal. Il Bistro also has a late-night menu for those lovebirds that enjoy an after-hours bite to eat. 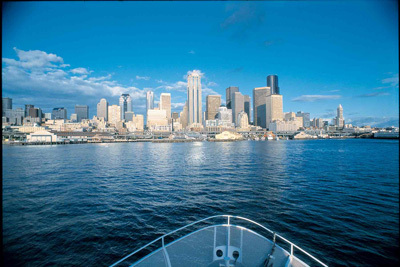 The Argosy Cruises harbor tour is one of many romantic dates in Seattle. Find a seat on the right side of the boat facing the front to get the best views. It'll give you the perfect excuse to cuddle up next to your sweetheart! The Cascade and Olympian snowy mountains make a serene backdrop for an entertaining and informative Seattle Harbor tour. The magnificent Alki Beach starkly contrasts the great heights of the Space Needle. Gaze at the sky above and see just how high you were. Watch the container ships as they tread the waters. They look like cubed collages floating in the distance. Experience pop culture at its finest. An interactive journey into the world of music, literature, video games, film, and even television, the Museum of Pop Culture is full of fun and exciting Seattle activities perfect for the cultured couple. Go back in time to the most thrilling moments in rock n' roll history. Watch music performances and light shows in Sky Church, complete with a 60' HD LED screen that'll take you back in time. Impress your significant other with a rocked out recording in the Sound Lab. Whether you're playing your heart out on a guitar or serenading your girlfriend in a soundproof room, the Sound Lab transforms any date into a self-made concert! Complete the exciting date in the Guitar Gallery: The Quest for Volume, where 55 vintage guitars dating from the 1770's until now are on view. Silver Screen Sweethearts See "The Big Picture"
Perfect your "yawn, stretch, and put your arm around your date" move and see a movie in style at Seattle's Big Picture theatre. Voted one of the Top 20 Movie Theatres in the World by Men's Journal, not only does the Big Picture show movies on its glorious big screen, it also plays host to a bar and lounge where you can enjoy a drink before the movie starts. If you're enjoying the film and need something to go with the theatre's gourmet truffle popcorn or white cheddar popcorn, servers will bring a hand-crafted beverage of your choice to you in your seat. Whether you're heading to the top of the Seattle Space Needle, or cruising down below on the Argosy Cruise harbor tour, don't forget your Seattle CityPASS: the ultimate romantic package deal.